On June 9, Grassroots Campaigns, Inc, locked out their unionized employees. This campaign was a response to the immediate needs of the employees, and has since been closed. This campaign is now closed. 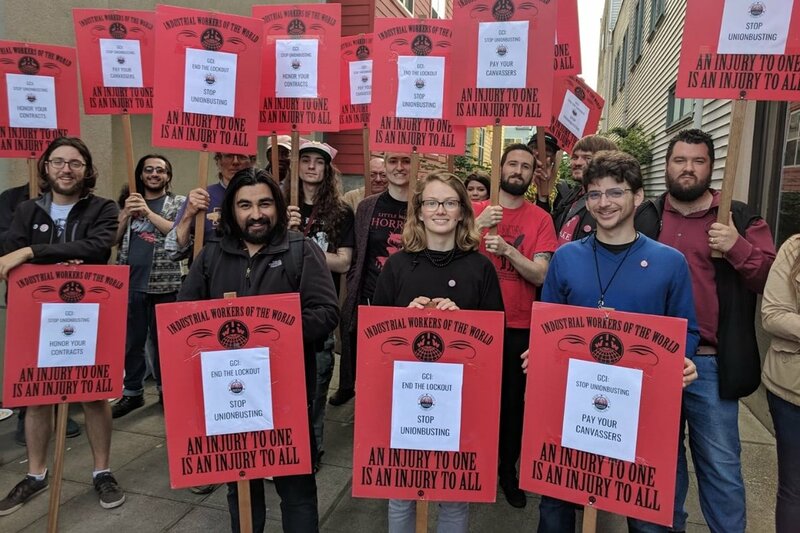 Thank you to everyone who helped support the workers, and the Seattle GMB of the IWW. Your support was essential in mitigating the damage the bosses did to the workers, and your solidarity was much appreciated. Less than a week after our Unfair Labor Practice strike, GCI announced their third lockout by claiming ”permanent closure.” In labor terminology this is known as a “Run-Away office,” where the company leaves the jurisdiction to squash labor activity. They claim that they cannot find a Director even though they never posted the job and refused to accept applications. IU 650 will be taking action. This is their third attempt to shut us down, and it won't be their last, but our workers do need to pay their bills in the meantime. Please stand with us in solidarity. Any and all support you can offer is greatly appreciated. We are incredibly grateful for all of the outpouring of solidarity so far! It means a lot to see we have so many folks at our back. Unfortunately, in the month since the lockout ended, GCI has shown absolutely no willingness to deal with us in good faith. They have actively sabotaged our ability to fundraise in hopes of finding justification to fire us. They have illegally fired several canvassers in different cities. To top it all off they even temporarily locked us out again this past weekend. Because of these constant unfair practices, we are ON STRIKE! Today, Friday, July 27, we notified our employer that we have begun an Unfair Labor Practice strike to demand an end to the company's notoriously shady practices. Any support you can give will be greatly appreciated as this fight continues to escalate."